One resident raised concerns about the impact of the Target on local small businesses. Hyde Park’s new Target, located at 53rd Street and South Dorchester Avenue, had its grand opening on Sunday. The store contains a CVS pharmacy and a Starbucks in addition to a curated selection of Target items. These include a fully stocked pharmacy section, a large selection of groceries and household goods, and a large selection of beauty products. The store also sells a limited selection of electronics, home furnishings, toys, and clothing. The Hyde Park location has been open for limited hours since Tuesday, when it held a ribbon-cutting ceremony attended by local community leaders. However, Sunday marked its permanent opening. To celebrate, employees at the front of the store handed out white canvas bags with red dots to shoppers. Children received stuffed dogs with the Target logo. The store was bustling on Sunday afternoon. Registers had consistently long lines, and people streamed in and out of the front doors. Jakiah Browley, another Target employee, agreed that turnout was high. “I wasn’t expecting that many,” she said. 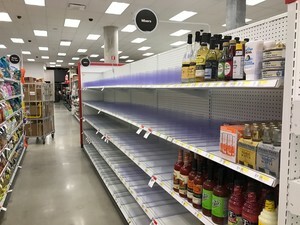 Target has put up liquor labels on one of its aisles, but the store does not yet have permission to sell alcohol. Most of the store’s shelves were packed to maximize space, although two aisles of empty shelving stood out—they were labeled with the names of various brands of wine, beer, and liquor. Target has applied for a liquor license, but doesn't yet have permission to sell alcohol. A community meeting on Wednesday at 6 p.m. will consider Target’s application. The meeting will be held at Murray Language Academy on South Kenwood Avenue. Customers present for the grand opening were generally happy with the store, although several said they were disappointed by its small size and limited selection. At approximately 20,000 square feet, the Hyde Park store is a TargetExpress, the smallest size category of Target stores. In comparison, typical full-size Targets range from 80,000 to 160,000 square feet. However, local resident Eduardo Perozo, who was shopping with Susan Mochel, said he was unable to find some items he was looking for. “And there’s no bike rack,” Perozo said, a problem for Perozo and Mochel, who biked to the store. Target is geared toward pedestrian shoppers, although a limited number of free one-hour parking spaces are available above the store. Mochel added that she was worried about the impact of the Target on local small businesses, such as Hyde Park Produce. In contrast, Target employee Browley said she believes that the Target will coexist with neighboring businesses, because it fills a niche that other Hyde Park stores do not. “There’s not many grocery stores or any markets like this, besides a Walgreens and a CVS,” she said. The Hyde Park Target will be open from 7 a.m. to 10 p.m. on weekdays, from 8 a.m. to 11 p.m. on Saturdays, and from 8 a.m. to 10 p.m. on Sundays. This article misstated that the community meeting is at 5:00 p.m. It is at 6:00 p.m.